Meanwhile, as those of you who suffer from BMS know so well, life goes on and so do regular dental appointments. Even if you don’t correlate the onset of BMS to dental work (many of us do), having someone working on your mouth when you are in pain can still be psychologically challenging. 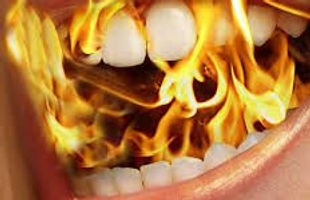 Burning Mouth Syndrome sufferers often have a dryer mouth and less saliva flow than normal, and recent research is now showing that there are actual biomarkers in our saliva. You can read more about this study at BMS-Support. More work is needed, but this may turn out to be an important advancement in BMS detection and diagnosis. Imagine if you could bypass the years and dollars we put into ruling everything else out, and with a mere saliva test, could get the diagnosis you need to start treating your burning mouth. You really need to go. Twice a year if you can, and at least once a year if you can’t. A drier mouth means more bacteria get to play, and before you know it, you have expensive, painful dental work that can actually exacerbate your burning. No fun and preventive care can help you avoid much of that. Talk to your dentist and dental hygienist about what irritates your mouth, and what techniques you don’t find as uncomfortable. I discovered that the baking soda spray they often use to power plaque off the teeth was not something that agreed with my mouth and so they changed over to plain water and then use a tool by hand to make sure my teeth are in tip-top condition. If mint bothers you, ask for another flavor of tooth polish. Speak up, because they can’t help you if they don’t know, and if they don’t want to help you, then find another dentist who will. I am not sure what you mean by MI since those initials can apply to a couple of different illnesses. Can you elaborate? If you are a Facebook member, there are quite a few support groups for BMS and the issues of getting older that can be found with a basic search. My approach has been to read about the group and then if it is private, ask to join. Once you are approved, take a bit of time to read older posts, check out the files that have been uploaded, and get a feel of the philosophy of the group before commenting or posting. It doesn’t take long to figure out if this is a group you resonate with or feel that it has new knowledge to share with you and you can continue and start contributing, or if it is not a match, it is easy to leave. I wish you the best of luck!